It is indeed a great pleasure for us to cordially invite your respective Campus Faculty and aspiring students to six months training program, which is being conducted by our organization for the batch 2015-2019 graduating in June, 2019. 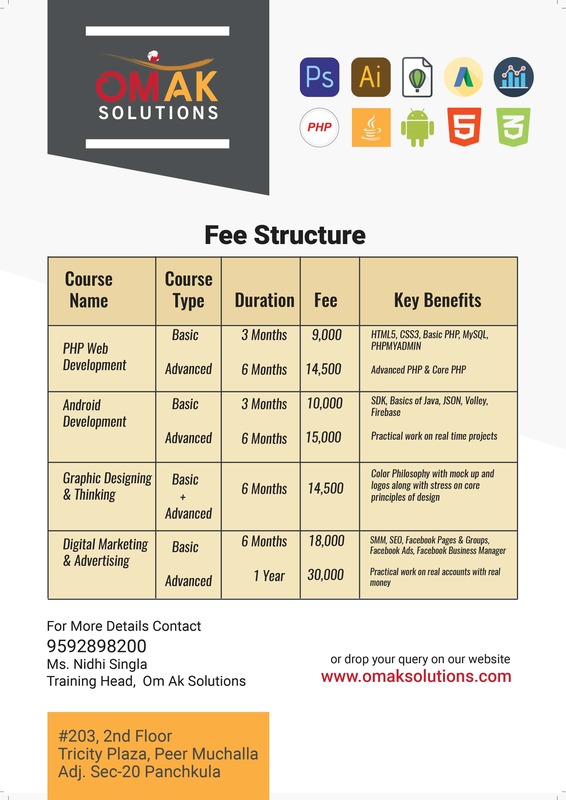 Om Ak Solutions, location in Panchkula, has been in the forefront imparting high Quality Technical Training and is one among the selected organizations in the Panchkula-Chandigarh region which are providing professional platform training along with expert’s fellowship programme enhancing your professional skills which will help you in your recruitment. The “Digital India” programme initiated by the Indian Govt. has created vast scope in IT field, the requirement of skilled it professionals is increasing with a high rate in India. There is no way to sustain in the professional career in any company until you have the complete skill set and an urge to learn. An independent research says that 80% of the Technology aspirants in India lacks the right skill set which weakens the base of their professional career. To fulfill the same, we proudly present you with our industrial training programs that are designed in a way to provide you with “Project & Reports Oriented” plus “Job & Career Oriented”, completing all requirements of your academic curriculum. Our training modules are designed by professionals who possess in-depth experience about the technology and the need of such skill development programmes.